Enter cash tournaments, competitions, and contests to win cash prizes. Play online games of skill or luck. Discover how to bet or gamble carefully & cleverly. How Can I Win Money With No Risk? How Can I Use Skill To Win Money? Will Luck Bring Home The Cash? Three top level methods you can use to win money online. Learn how to limit losses, reduce risks, & how not to lose. • 5 Essential Steps • Best Way To Win Money? My name is Steve Cross, and I have been studying and writing about the subject of winning money since I was a teenager. That's a lot of years! It's a subject that is so vast that I could present you with over a thousand pages and still leave more to cover. But we can make a useful start with those you can find here already on winmoney101. If you're looking to make money online by winning it - whether it be instantly, for free, by luck or by gambling - this website is for you. It contains much of the information you'll need on the different ways to do it, what the best ways to try are, and how to limit any potential losses. There are sections devoted to each of the three top level ways to win money, plus detailed pages on each of the methods and the different aspects of those that you'll need to consider. To get a feeling for the wide range of options available, just to the right are a selection of the more recent articles on different money winning methods you'll find throughout this site, while the newest article focuses on tennis betting predictions services. Winning money is not easy, and definitely not guaranteed. You can't (and won't) win every time. But if you don't know what's on offer, if you don't know what to look for, and if you don't try, you can't ever win. To succeed you're going to need to be careful, well informed, and ready to take your chances. You'll need to know what to watch for, and the tricks, tips, and strategies that may help. In most cases - but not all - gambling or playing games to win more money means you're going to be risking some of your own. Gambling to try and win money has a number of dangers, not least the possibility of losing money. It's impact on you might not be just limited to purely losing money in itself. Controlling how much you might lose is a critical skill to learn, and can be just as important as learning the skills and strategies to help you win. See the responsible gambling page for more info. Protecting Your Cash : What Are The Risks? The key pointer to remember with any form of gambling or betting, or in fact any type of effort you make to achieve something, is that it needs to be fun. Or at least you need to feel something positive from the attempt and achievement. If you don't, you probably won't stay the course. If you're not enjoying your time trying to win money, then almost certainly that means you're either losing some, losing time which you'd value to pursue other activities, or affecting someone else around you that you care about. As far as betting or gambling goes, it's a certainty that at any time where you get to the point where you're thinking it isn't fun or valuable then that's the point you need to be deciding whether to call it a day. The truth is that very few people make a living at betting or gambling. Very few people ever experience a big win. If you decide to risk your own money to win more of it you need to be acutely aware of this hard fact. That's why it needs to be more than just a 'pursuit of money' exercise, I'm convinced that the individual approach to this spells out whether you're one of the few who will have problems controlling their betting activity, or whether you can use it in careful ways to get a little extra enjoyment and throw in the chance to maybe get some extra cash. The odds against a cash prize win are often high, but you don't always have to risk a great deal of money to have a chance of hitting that elusive jackpot. What Does This Guy Know? : Why Should I Trust Winmoney101.com? Do you know what? On a lot of websites you'd possibly be right. But this isn't one of them. It's not alone of course, I could point you to hundreds of sites that you can trust, and there are links to many of them on these pages. My name's Steve. You can read more about me on the about us page of this site, or the 'about me' page to be more specific. I've spent the last 34 years trying out different ways to win money in one way or another....and I'm still standing. Have I found a way to consistently win money with a foolproof method? No. It does not exist. (well actually I'm working on something that needs a lot more testing, but maybe it does exist! More about that another time). Have I learned a whole bunch of lessons? Yes, and some of them on the painful side - but I've had some fun times and a lot of enjoyment along the way too. I've even had one or two very nice wins along the way. I don't regret any of those 34 years worth of trying. It's taught me a lot of lessons. I have managed to control it. Be careful - I'd like to see it to be a joint effort that you know how to control it too. Take a look at the responsible gaming page before you make any attempt at any form of gambling. Please read it thoroughly. Winning is a numbers game. You can get by with just playing or betting with no regard for percentages, odds, or the amount of cash you're wagering. But in the long run all of these will be important considerations. Look back 15 years ago. If you wanted to win some cash you'd have needed to jump in the car or get your walking boots on and travel for it - to a bingo hall, to a land based casino, or to the bookies. Today many of the opportunities can be found online while you're at home, they're increasing all the time, and there's a ton of information available to help you understand how to get the best out of them. Some ways to win are free, but many can cost you some of your hard earned cash. There are opportunities to win at games of pure chance or luck, or by using an element of skill to increase the money in your bankroll. You can win money playing video games of every description, or by entering writing, art, photography, or business-related contests and competitions. With so many different options, its increasingly important to be aware of what all these money winning opportunities are, how they work, and the best ways to try and take advantage of them. This of course is the essence of our whole section devoted to the 3 key ways to win money. Because these opportunities are online, in general it doesn't matter where you are in the world. You can legitimately try to win money online from Canada, Australia, India, the UK, the US, Kenya, Malaysia, New Zealand, South Africa, Ireland, the UAE. And the same goes if you live in Adelaide, Dubai, Queensland, London, Melbourne, NSW, Vancouver, Victoria, or Las Vegas. Anywhere you can name, if you can get online and it's legal wherever you are (remember in most legal jurisdictions you won't even be able to try if you're under 18 or 21), there will be ways to play or take part in these games and competitions and try to get some of the cash on offer into your pocket. As for the best ways to win, the reality is that different options will work in different ways for different people. To find the best for you means knowing what's available, and where your skill and knowledge base lies. We've said before that many of the ways to try and win mean risking some of your own cash in the attempt - so unless you only focus on those free ways to win, the best approach is to realize right from the beginning that you might lose. With that in mind, you can focus on what will give you the most enjoyment and entertainment. Ideally for as little cost as possible. You can prepare yourself for that chance of losing, find the best strategies and tips for reducing the chance of it, and identify those types of opportunities which will suit you best. That means those ways that suit your budget, your skills, your knowledge and your level of aversion to risk. And now we get to the fun bit. Although actually making the attempt to win can be great fun (and this approach is a way I advocate as one of the best, particularly in the case of playing casino games), we all want to win. If you make enough attempts (even in the games where pure luck rules) you will get a win. It may not be enough to cover the money lost in trying to get it, but a win it will be. Makes it sound easy, doesn't it? But it's not. Going headlong in and betting or gambling recklessly is a surefire way to lose. This is the reason why step 4 is perhaps the most important - winning money consistently. Almost anyone can experience a win of some sort with normal luck and application of knowledge or skill. But to win consistently is the real trick. Unless you hit some sort of jackpot, high odds, or high value bet win, then winning small to reasonable amounts on a regular basis - and ending up with more money than you started with - is the holy grail. If you know how to win jackpot type money regularly feel free to let me know how! The essence of true bankroll management and common sense. Sure you'll get some great entertainment value from winning a pile of cash and gambling it all back again. But it'll probably hurt too. Ensuring you have a plan to take some of it out of any positive cash account is always going to be a great idea. The video below is well worth a watch. It's a very open perspective on playing slots in a casino. It makes some very good points about how you should treat attempts to win money in general. This video features regular industry updates from APCW.org. The APCW regularly produces valuable videos focusing on different online gambling subjects. This video comes from their "Perspectives Weekly," series - which may well be the most widely viewed, longest running video series in online gaming. The Best Way To Win Money? Everyone's going to want to know what the best way to win money is, right? This is a subject that we could debate for a long time, and the answer depends on the perspective we're looking at it from. It depends on whether we mean the best way to actually win money (in other words the best way to achieve a profit), or the way that's going to give the most entertainment for our money and time. Each of the ways to win that I cover on this site offer their own specific benefits, and in the end it'll be down to you to settle on the one(s) you enjoy (or are successful at) the most. If you want to win quick, fast, or instant money then online instant win scratch cards or lotteries are going to fit the bill. Whether you win or not is down to pure luck of course. If you're a gamer by nature then it could be skill games or cash video games which grab your attention. Focusing your efforts on winning with skill is always likely to get the most consistent chances of making profits. To play for free you'll want to be looking at the free ways to win, probably by entering cash prize competitions as a starter. For my personal favourite of winning by luck then you have a few choices, but without a doubt it's casino games which take the crown. For me they offer the greatest thrill - and the greatest chance of a big prize. They are risky though, and it's very easy to lose money. All of these fall somewhere under our general banner of the 3 key ways to win money. Playing online casino games is one of the most entertaining ways you're ever going to try and win some cash. But unless you're very lucky, there are risks that they'll wipe out your bankroll fast. In fact, they're unlikely to result in winning money in the long run. Casino's are built to take your money. Winning at them is never guaranteed, but sticking to games you enjoy, being careful with your money, and playing on quality sites will help. If you just want extra money, then either avoid them or go for a one hit win on one game. That said, playing at the casino appeals to players from all over the world. Canadian players are particularly fans of online gaming, and any Canadian player interested in winning money online can indulge in playing online slots, blackjack, video poker and similar games of chance. A listing of sites for Canadians can be found in this top casinos list for Canada. And of course it really doesn't matter where you are as long as it's legal. There are plenty of options for playing online. There are opportunities to win money in Canada, across the US, in the UK, or anywhere else in the world. If you prefer to wager spontaneously, you will likely enjoy online roulette games like those at www.onlineroulette.ca. Bet on red or black, choose your lucky number or employ a strategy. This game has a lot of fans across the world and has the ability to deliver huge wins for each spin. Of course it is possible to win playing casino games, but you'll want to be taking advantage of everything possible that'll help. Increasing the amount of cash you have to play with is a good start. Just the same as with poker, bingo, or sports betting, there are bonuses to be had and promotions to watch out for. For some great bonus offers, you can try OCC's bonus page with the latest online casino bonuses. If you're not sure which are the best sites to play on, perhaps try out the listings of casino reviews on CasinoReef. To end up, if you just want to stick with playing a straightforward casino card game that offers strong winning chances, then 3 card poker is the best to start with. Simple to play and with winning hands around 25% of the time, 3 card gives plenty of entertainment value. 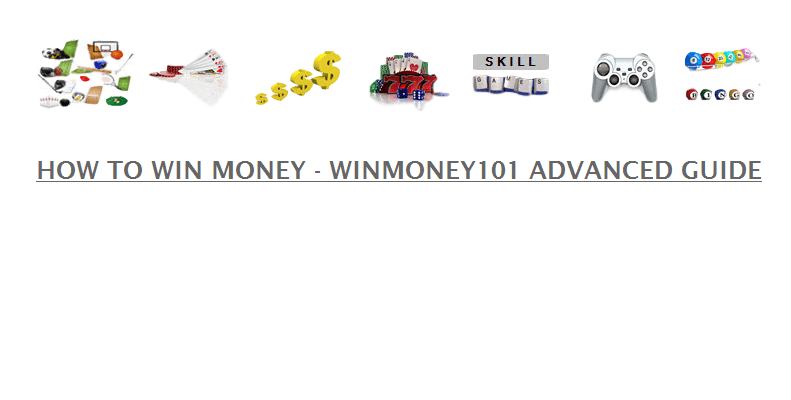 You possibly thought that when you landed on winmoney101 there might be one or two pointers for making some extra cash. We've seen that our subject is much broader than that, and there's a lot to consider before you dive in and start trying out the options. If you're still not sure where to start, I'd recommend you head on to the how to win money page. It offers a good starting point. Whatever you do - make sure it's legal. And don't get involved in any form of gambling if you're under age. The only other thing I can say here is to wish you good luck whatever you do. I sincerely do hope you can win the money you're looking for. Feel free to contact me if you have any questions. Advice is free, and I'll always answer.